The Emerald Cut first appeared as a bead and pendant in 2016, the flat back version in 2017 and this year we’ve got the sew-on stone. Sew-on stones have 1.5mm holes at each end making them perfect for threading cords and adding jump rings. Heart shaped sew-on stones were ideal for bracelets but the beauty of the emerald cut is that it can be added horizontally or vertically and so perfect for pendants and earrings too. Look at the selection of jewellery at the end of the post for ideas. Make a simple bracelet with wax cotton or leather (steps instructions below) or add to a macramé bracelet featuring the new hexagon spike beads (5060). Cut two 25cm lengths of wax cord or leather. Bring the cord up through a hole on the bead and take the tail underneath the main cord. Take the tail over both the main cord and the tail again and then down through the loop you formed. Pull overhand knot up taut and repeat the knot on the other end so that both tails are on same side. Add the remaining length of cord and trim so that the length is the same. Cross both cords over together so that tails are in the opposite direction. Repeat the overhand knot worked in steps 1 and 2 with both cords on one side, going around two cords this time – under then over and down through loop. Repeat with the other tails – again keeping the knot going in the same direction. You can adjust the position of the slider knots you’ve just made. When the knots are together in the middle you should be able to just put your hand through. Trim the tails to about 2.5cm. Add cord ends with flat-nose pliers, folding one side over first and then the other. Trim the loop off with heavy duty wire cutters. with flat-nose pliers, folding one side over first and then the other. Trim the loop off with heavy duty wire cutters. It may be raining today but there is still plenty of summer to go and lots of time to make this beautiful cuff bracelet. The focal crystal is new this year and part of the Swarovski Designer Edition from the S/S 2018 Innovations. These amazing crystals were designed by Chris Bangle, the legendary former chief designer at BMW. I’m such a fan of macramé especially the micro size, using S-lon cord, as it makes up into such fabulous jewellery. Two of the top trends for this year – statement cuffs and macramé work amazingly well for this design. I’ve added tiny Swarovski rondelle beads for contrast but you could use bicones instead. These amazing sculptural crystals were designed by Chris Bangle, the legendary former chief designer at BMW and include the tilted chaton and tilted spike. The colours are applied to part of the crystal to enhance the amazing 3D effect. This cuff design was inspired by Swarovski’s theme ‘No normal’ which is all about embracing differences, whether it is design, perspectives or life itself. Tilted stones are part of the Fancy Stone family of Swarovski crystals and available from Jilly Beads. You’ll also find they’ve got the 3mm pearls in iridescent light blue too! Ribbon flowers are so easy to make and this design, which I made to showcase the Swarovski 2018 spring/ summer innovations in London earlier this year shows just what an impact you can create. These exquisite pear shaped fancy stones and little round stones are from the new Crystal Shiny LacquerPRO range – the colour names themselves are so inspiring! They just shout SUMMER – Crystal Azure Blue, Crystal Peony Pink, Crystal Summer Blue, Crystal Mint Green, and Crystal Light Coral. Don’t you want to dive right in? Is there a better way to add the wow factor to a simple dress? With so many exquisite ribbons around you can match the colours to your dress or go for a contrast making sure that one of the ribbons matches the dress exactly. The design is featured in issue 25 of Dressmaker magazine with step-by-step instructions and you’ll be able to download diagrams for the flowers from 27th July 2017. 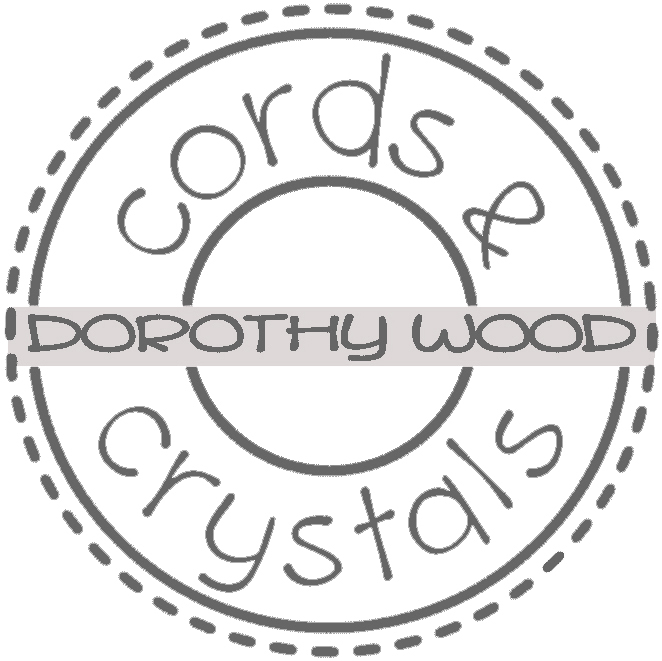 Crochet is one of the fastest growing crafts in the UK so it seemed the perfect time to launch this range of jewellery kits which combine my two favourite things – cords and crystals! So many people are learning to crochet and these designs are simple to make using basic chain and double crochet with Swarovski crystals added in as you go, they are suitable for all abilities. When you design kits, especially something like crocheting that requires a certain tension, you don’t know if other people can replicate the design but as I taught some workshops I was delighted to find that people could crochet the little stacking bracelet so that it looked exactly like mine! I’m sure I’ll develop the packaging again but for the Knitting and Stitching Show in Edinburgh these little gift boxes were perfect. The stand was only 2m square so the table had to go down one side but it meant we could stack boxes ready made towards the back of the stand leaving the front area to display the goods, demonstrate and sell! It’s always interesting to see what sells at a show – the new bright colours inspired by Pantone 2017 spring/summer trend, certainly drew in the customer though for Edinburgh the best sellers were amethyst, denim blue, and purple. It was also fun watching people mixing and matching the colours picking different combinations to suit. Deer Hide leather is a fabulous new lacing material that is just so versatile for jewellery making. The lace is ethically sourced and available in a wide range of colours. I’m getting ready for summer, inspired by the beach and seashore, making two pretty bracelets using sand and stone blue shades available from I-Beads. You can learn how to plait with 3, 4 or 5 strands below and make yourself a pretty wrap bracelet. Instructions for the jump ring weaving bracelet follow at the end. As well as these two easy to make bracelets you can also buy a pattern for this beautiful multi strand cuff bracelet from my ETSY shop. The deerskin is very soft and plaits beautifully – so don’t stop at the usual 3-strand plaiting! It is just as easy to plait with four or even five lengths to make different widths of bracelet or cuff. Secure the leather at one end with tape or pin to a cork or macramé board. You will need an extra 1/3 to 1/2 more on each strand than the finished length to plait. Use 10mm ribbon crimps to finish the ends of the three strand plaiting. Add an initial charm (from I-Beads) with jump rings and add a lobster clasp. Plait approximately 31cm to wrap around twice, or 46cm to wrap three times round your wrist (17.5cm standard size). Use these 25mm or 43mm magnetic clasps from I-Beads to finish the wider plaiting and make a quick cuff bracelet. Why not make this quick and clever idea? Use 8mm jump rings to weave two strands of deer hide lace to make a simple bracelet and finish with these cord ends. Add a small jump ring to both ends and a large lobster clasp to finish. Every Valentine’s Day hearts become the motif of the moment but it is a incredibly beautiful shape to design with any time of the year. How many different heart shaped crystals do you know about? I’ve had a look see and decided to show you some of the different heart crystals available from Swarovski to help in your designs. I used two sizes of heart shaped fancy stones to create this fabulous necklace. These no-hole crystals have matching settings and you can order either with or without holes and in a range of finishes and in ‘Breaking news’ Swarovski have just added round stone settings to their range! Settings with holes allow the DIY designer to make fabulous crystal jewellery without using a soldering iron. You just sit the stone level in the setting and bend the lugs down with pliers. Wiring jewellery, like this fabulous Bollywood style necklace, is one of my favourite techniques and one that you should be able to do too. In this necklace the cupchain is wrapped with wire and then attached to the floral centre piece. The heart fancy stones are wired into the cupchain to create the beautiful flowing shape. What crystals are heart shaped? Plenty of crystals to choose in a range of heart shapes too! My favourite are the sew-on stones, perfect for that quick, easy to wear bracelet using macramé or switchback braid. Check out this link to Beads Direct and Jilly Beads who both have lots of heart shapes. Pendants – made up to 37mm, these generally have a hole at the top, though one style has a heart shaped hole. Available in a range of shapes. Sew-on stones – easy to use flat back foiled crystals that have a hole at both sides. Perfect for stitching onto a backing or attached with jump rings to designs. Be Charmed pendants – beautiful charms and pendants with tiny Swarovski crystals embedded into clay. Flat back crystals – available in hot fix or plain these little heart crystals are perfect for embellishing clothing. Try placing the hotfix on a bead shaped from Fimo and bake in the oven to stick. Buttons – beautiful heart shaped buttons are perfect for making a fastening for macramé and other styles of knotted jewellery. They also look stunning on an embroidered design. Be inspired and buy some Swarovski Hearts for your next jewellery project!